I think that the Black Conferences, regional conferences, or whatever you want to call them are on borrowed time. However, I do not like the rhetoric of those who are seeking to do away with these conferences. I think it demonstrates why they were created in the first place. So I decided to do a post on how the Black Conferences should end when they do. 1)The church should acknoweldge the debt they have to the Black confenreces. Many churches split over race issues. The Seventh-day Adventist church did not. These separate conferences kept the church together. Don’t come and tell me we are the only church with separate conferences. Other churches have separate deonominations. Look at the methodists. They ahve Black methodists and the premominately white United Methodists. The Baptists have a plethora of Black denominations largest being the NAtional Baptists and the predominately white Southern Baptists. The Black conferences have played a part in keepign the denomination together, so we should thank them instead of vilifying them. WE also should thank the confernces for the phenominal growth of the Black work. We can thank great evangelists and pastors of the past as well as the presesent. There has been an explosion of growth since the Black conferneces. It is true that the growth has slowed some, but this has been a success. 3) Black folks wanted to be treated with respect before they wanted black conferneces. Black confernces were created because of whtie racism plain and simple. It was becuase Black folks would not be treated with respect in the dominant conferndces. Now I have been accused of racism for stating that simple fact, but call me what you will, truth is truth. So the dominant church should apologize for why the thesse conferences had to be created. Just as Isreal repented of sins created earlier, the dominant church needs to apologize for its treatment in the past. They need to repent of its not allowing black people to worship in thier churches. Yes they called cops on Black people who wanted to worship in their churches. Yes it happened. And yes if we are to give the confernces a proper burial we need to acknowledge it. 4) They need to disolve all of the conferences and unify again under right principles. It is simply not valid to disolve black confernces and keep the other confrences in the same area. IF you are going to disolve the confrence, you must disolve them both. And then unify. That is the only fair thing. Unless the Black conferences existence is illegitimate. 5)We cannot sidestep our responsibility by eliminating the confernce level. Union of chruches or whatever you come up with, the church still must give the Black Conferences a proper burial or the ghosts of why they were even created will congtinue to haunt us. And the real issue is that the elmination of Black conferneces ain’t gonna eliminate the Black churches anyway. I had an interesting conversation with a member of one of our churches the other day. The member was dismayed at what he perceived as a small minority of the church though powerful, but stagnant lay leadership standing in the way of the progress of the church. These people should simply step asided and let the church progress. I think this is an interesting question that comes up often. A few thoughts immediately came to mind. First, all leadership is considered backward and not effective by someone. I know I have been considered that by some. Perhaps I was. At any rate, when you are voted to leadership of the church, you are expected to act in ways that you think are in the best interests of the church. If you vote someone as an Elder, don’t get mad if they run the church in a way that you don’t think is best. Simply vote them out when the time comes. Here the member seemed to be upset with the church elected officials doing what they think is right. Yet, it seems that the church wants to keep them in becuase they keep electing them. If these people are truly in the minority, then why doesn’t the majority just vote them out? Well, perhaps it is becuase the majority does not wish to speak. Maybe they just want to enjoy the benefits of a Sabbath morning entertainment session rather than taking ownership in the church they attend. 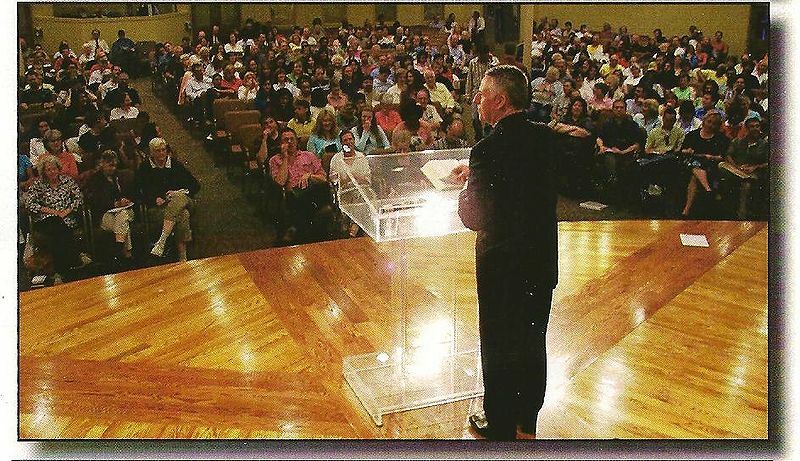 Whatever the case, most of our churches are run by a vocal 10% of the church simply becuase they are the only ones that show up at the business meetings. That elder who we assume is backward is doing what he thinks is right. Don’t get mad at him, he is working and buidling up the church to the best of his ability. He or she is not getting paid for that effort that is invested in the church. And as one who has been a local elder, he or she is not getting the respect that you think he or she is. At any rate, don’t get mad at the elder, get mad at the 90% of the church who think that church is something that you just show up for. Get mad at the 90% who do nothing and don’t want to do anything. Get mad at the 90% who think it is too much to show up for a once a month business meeting. In short, vote the elder out and put in effective leadership. But the elder is only a symptom of the larger problem. When you build a church based on those who only wish to consume religious entertainment, then you will be disapointed trying to turn those “consumers” into “producers” of anything. In many cases, they will simply move on to the next “young powerful preacher” who has a better “show” on Sabbath morning. Can You Teach Me To Do An Adventist Sermon? That is an interesting question that came to my box a little while ago. The preacher had visited my Soul Preaching website where I seek to teach the fundamentals of the Black Preaching Tradition. The questioner was an Adventist local elder who wanted to improve his sermons, but wondered where can he plug the “Adventism” into them. The questioner rightly noted that the Soul Preaching website is an interdenominational resource that does not teach the doctrines of any body. What is it to preach something? Some people think that a lecture on religious themes is a sermon. How many of you have listened to a preacher of that school. You end up with a long 60 minute distilling of a doctrine that is meant to enlighten the mind. Yet the heart is unstirred. Often these lectures have very little practical value. At the end of the day, tell me how this doctrine you are preaching makes a difference in my daily life. That is your job preacher. Another issue that might be going on is that the questioner might be thinking that the worship sermon is the only time to teach doctrines. So we must do it then. It is very problematic to try to have the preaching moment to be your whole training. What about Sabbath School? Do you use that as a traning opportunity or simply a preaching opportunity for your local elders? What about Wednesday Night Prayer meeting. I like how our Baptist sisters and brothers normally call this Wednesday Bible study. Do you have prayer? Do you have study? I am actually hearing about churches around doing training of their members. Here in Nashville Riverside SDA Church under Furman Fordham seems to have a training program to get people on the right track. The point that I am making is that it is unreasonable to expect the one hour worship sermon to bear the brunt of the theological training in a church. But more than that, should it even be. I would argue that the sermon should foster an encounter between the people, God, and scripture. It should not be simply to learn facts for the mind. It should be an encounter that is informed by theology and the other things that we have learned, but no it is more than that. It is a time for the intellect and the emotions to celebrate the good news of God’s reign on this Sabbath day. So know and understand your theological understandings which includes Biblical wholeness (State of the Dead). Yes, go head on and get a deeper understanding of the theology of Sabbath and its great need at this time. Yes understand your theology, but don’t just preach it. Yes preach it, but then always take the time to Celebrate it. Turn the page. Be the Cheif celebrator of the implications of the truth you have presented in the sermons. AT the end of the day. You are not preaching an “Adventist sermon” merely when you give the facts of the Sabbath as being the Seventh Day. You are preaching an “Adventist sermon” when you use the principle of Sabbath rest to inform how you treat people on this day and the rest of the week. you are preaching an Adventist sermon when you use the princple of Sabbath rest as a theological tool to interpret what it means to live a faithful life in a world that is trying to remove all our rest. Yes, I am calling for you to tell your people what these doctrines mean. Don’t just tell them to me and tell me I better beleive them and sit down as if you have done something. No work to foster an experience with the Lord whom we understand better because of something about the Sabbath. So step one…stop thinking that an Adventist sermon is a Bible study that gives proof texts for a doctrine….